Starts off with nice toffee sweetness picked up from the caramel malts along with soft bread-like yeast flavor that helps mellow out the sweetness. The light flavors that kicked this beer off gave way to a slight bitter hoppy profile. The earthy bitterness continues to the finish leaving you with a somewhat dry aftertaste. Appearance: Unsurprisingly the color of this amber ale is…amber! Clarity is about 100% and poured with a nice two finger white head that didn’t hang around long leaving behind some fairly decent lacing. Smell: Not a whole lot going on with the smell on this ale. Toasted caramel and bready malts dominate the nose. Quite a sweet and light smelling beer. There is a very slight earthy hop smell on the end. Initial Taste: Starts off with nice toffee sweetness picked up from the caramel malts along with soft bread-like yeast flavor that helps mellow out the sweetness. The light flavors that kicked this beer off gave way to a slight bitter hoppy profile. The earthy bitterness continues to the finish leaving you with a somewhat dry aftertaste. Thoughts: There is actually a story behind this beer. 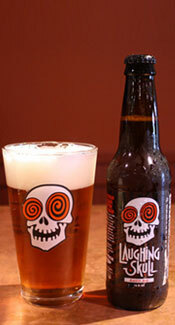 Laughing Skull beer was a special beer brewed by Red Brick Brewing (formerly Atlanta Brewing Co) for The Vortex restaurant in Atlanta. The beer was discontinued in 2005. However in 2009 after a few years of upset beer lovers and letters to the brewery Red Brick decided to bring this uniquely named beer back to the market. However this time it has been released as an Amber Ale and not a Bohemian Pilsner like the original. Sadly this beer is only available in the Southeast. Red Brick states that since it’s re-release this beer has been their biggest seller. There is good reason why this beer is so popular, the flavor is sweet, mild and pretty well balanced with a nice earthy hoppiness. There is not offensive about this beer, just a nice (low flavor) ale that makes for great drinkability. So as an Amber Ale there are much nicer beers out there but as a session beer, this does just fine. I highly recommend. Next: New features coming to TheBeerCritic! Sounds basic but solid, thanks for the review. I have heard less-good things about the Red Brick #s ale… so sounds like this is at least passable. Which is nice. Got any of this left in your fridge? I actually just picked up a sixer of this from the store down the block, and as someone thats taken a vacation from beer for a year or two, it was a pleasant welcome back. As every review Ive read agrees, its nothing spectacular or incredibly flavorful, but a very mellow, smooth ale. I intended to pick up something to enjoy with a homemade pizza, and I think I found a good one for the job. In Florida, the South East U.S. inundated with red brick beer, apparently.